Joe Gonzales is a native son of San Antonio who has enjoyed over twenty-five year's experience playing music professionally. Mr. Gonzales grew up in a city that celebrates every event, from Fiesta to Rodeo to Wurstfest, with music. This background is reflected in his solo repertoire that includes Classical favorites, Broadway Showtunes, Jazz Standards, popular Spanish and Latin American songs, and also Sacred music. 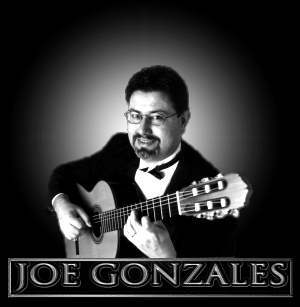 Joe Gonzales has performed locally with the Nat Vandiver Big Band, the Tennessee Valley Authority Bluegrass Band, the Regency Jazz Band, and the San Antonio Rhythm Rangers. While with the Award-winning Tennessee Valley Authority, Joe participated in a series of radio shows and re-enactment concerts that featured the music of Django Reinhardt, Stephan Grapelli and the Hot Club of France, and also the music of Bob Wills and the Texas Playboys. Joe currently performs in a duo with legendary jazz violinist Sebastian Campesi. He has also performed as a soloist for many local churches, and in that context, has been accompanist for noted soprano Linda Poetschke and saxophonist Kirk Whalum. His hotel and restaurant experience includes extended engagements at the Dominion Country Cub, the St. Anthony Hotel and the Plaza San Antonio Hotel.